To start using Matlab, the most important things to learn are how to enter matrices, how to use the ':' (colon) operator, and how to invoke functions. After you understand the basics (in the Tutorials Section), you can access the rest of the site as needed, or you can use the online help and demonstrations to learn the (many) other commands. You'll log on or invoke MATLAB, do a few trivial calculations and log off. 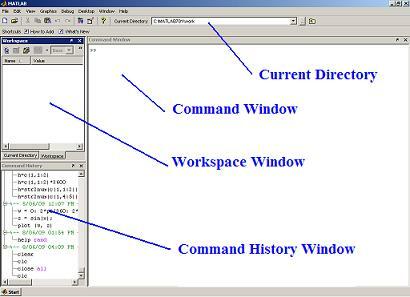 The History Window is where you see all the already typed commands. You can scroll through this list. The Workspace Window is where you can see the current variables. The Comand Window is your main action window. You can type your commands here. At the top of the window, you can see your current directory. You can change it to start a new project. Once the command window is on screen, you are ready to carry out this first lesson. Some commands and their output are shown below. Enter 5+2 and hit the enter key. Note that the result of an unassigned expression is saved in the default variable 'ans'. The '>>' sign means that MATLAB is ready and waiting for your input. You can also assign the value of an expression to a variable. MATLAB knows trigonometry. Here is the cosine of 6 (default angles are in radians). The floating point output display is controlled by the 'format' command. Here are two examples. You can also quit by selecting 'Exit MATLAB' from the file menu.